Malang is one of clean and cool cities in East Java has, without any doubt, been famous since long time ago. Historical remmants scattered around Malang Showing that it hat played important roles in may eras and stretching out from 112° 17' 10,90° up to 112° 57' 0,00° east Longitude and extending from 7° 44' 55,11° up to 8° 26' 35,45° South Latitude. Then the foreign tourists are commonly interesting to Malang's temples that save the historical value of the past Kingdom in Malang regency, they are; Singosari temple, Jago temple, Kidal temple, etc. 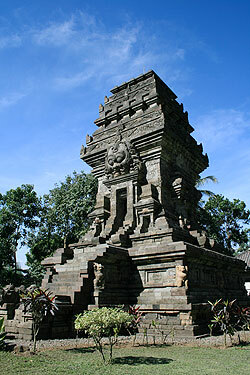 Beside that, Malang still has a lot of tourism objects that will attract you to visit it. Coban Rondo waterfall, Wonosari tea plantation, Wendit pool, mount Kawi, mount Bromo panorama, Coban Pelangi waterfall, Karangkates recreation park, and the others, are Malang's Interesting Places that presents their nature scenery.